When we added La Spazia (lah SPAYTS see uh) to our itinerary, it role was just to be a launching pad for the Cinque Terre. However, we found the city to be interesting in its own right. 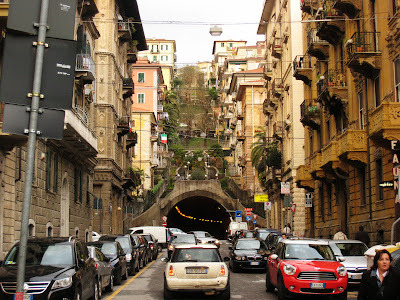 What's not to like about a city whose citizens are called Spezzini? 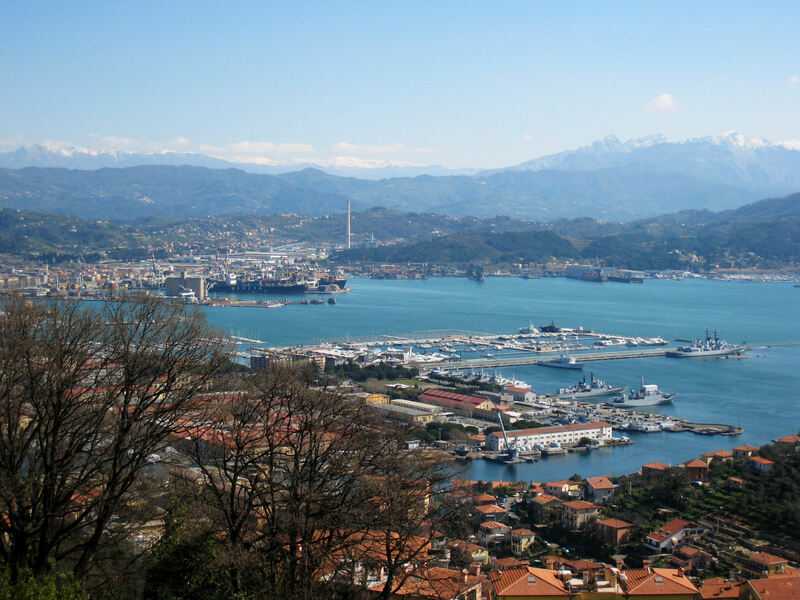 Big and bustling, La Spezia, on the Ligurian coast, is the home of Italy's largest naval base. Constructed in the mid-19th century, the base and related defense industries play a significant role in the local economy. 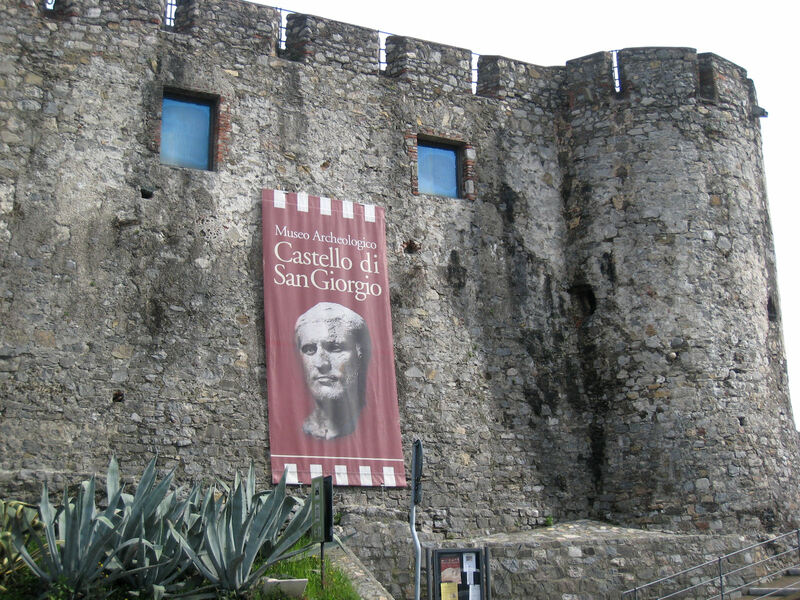 A major Italian port, the city also boasts shipyards and manufacturers of machinery and metal products. La Spezia's shipyard built submarines and battleships for use in World War I, but military construction ceased after the war. During the second world war, Germany used the port as a base for its u-boat operations in the Mediterranean. At the end of the war, La Spezia was used as a departure point for concentration camp survivors traveling to Palestine. 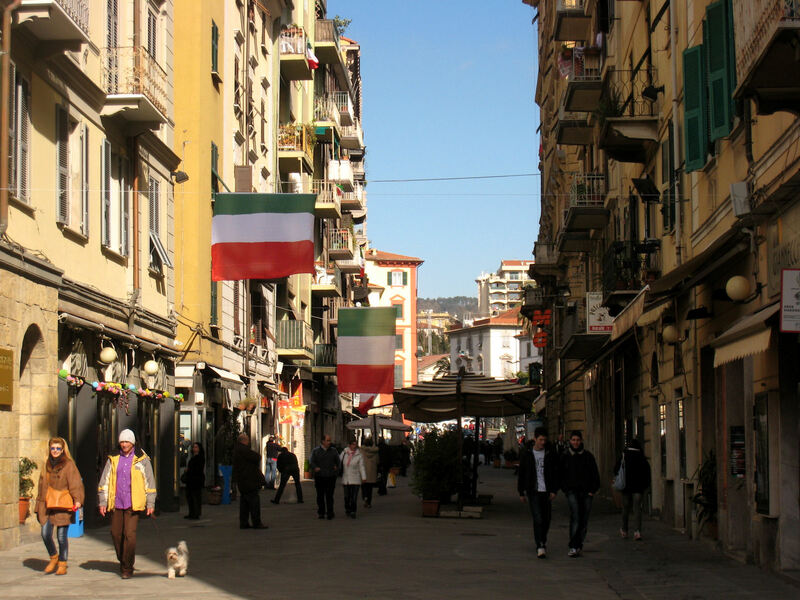 More than 23,000 Jewish refugees traveled through the La Spezia port, giving the city the nickname "Door to Zion" in Israel. As the capital of the La Spezia province, the city offers an excellent array of museums including an archeological museum in the artfully restored Castle of St. George. Among other local attractions are a naval museum, art museum, museum of seals, and a museum of modern and contemporary art. The museums had impressive collections and exhibits and were priced very reasonably at €12 (about $16) for a five-museum combo ticket. 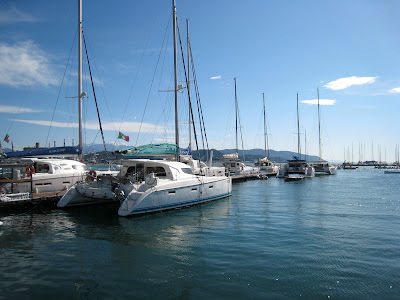 Yet what we enjoyed most about La Spezia was its genuineness. Although visitors certainly find their way to the city, tourism plays only a minor role in the city's economy. La Spezia is a city full of bustle and energy. Pedestrian-only streets in the city's main shopping area were constantly jammed with locals living their lives, shopping, eating and taking time to enjoy each other's company. Located between the Apuan Alp mountains and the sea, La Spezia brings its own brand of coastal attractiveness to the region. Though the mountains overlooking the city seem to be perpetually snow-capped, the white peaks are actually an enormous fissured block of marble. Some of the world's most famous sculptures are made from the marble of this region, including many of the works of Michelangelo. In fact, the town of Carrara, center of a massive quarry and famed for its beautiful white marble, is only 15 miles away. 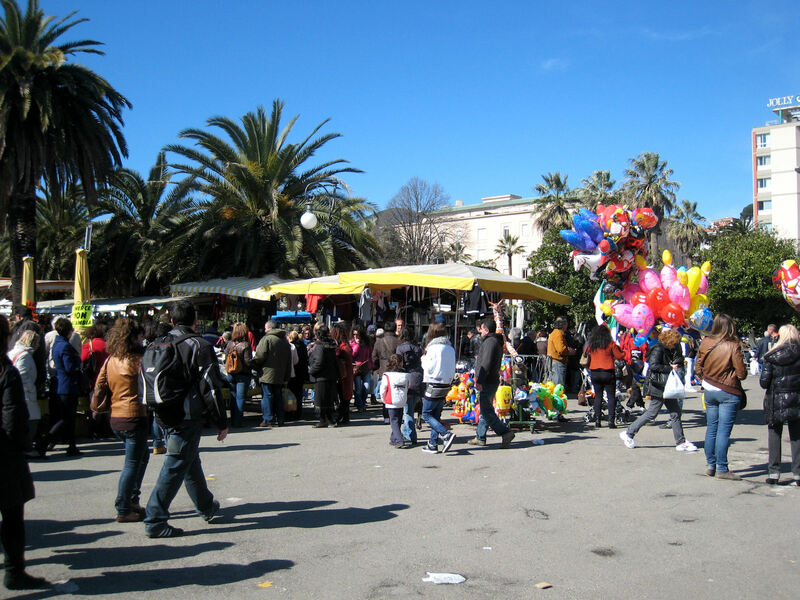 In addition to is naval base, La Spezia is famous in Italy for its annual town fair held on March 19 each year. Conceived in the 16th century to help promote trade in the area, this 500-year-old tradition is held on St. Joseph's Day, the patron saint of the city. Our visit coincided with this year's fair and we were amazed at the hundreds of stalls selling sweets, toys, clothes and shoes, costume jewelry, and any sort of household and gift items. Many visitors from other parts of Italy came for this special event. 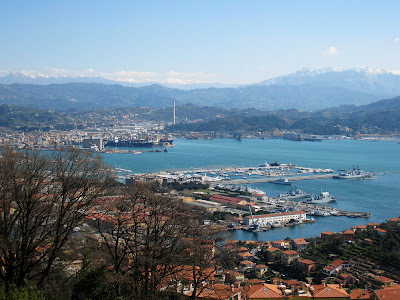 Though it may not have the physical attractiveness of the nearby Cinque Terre, La Spezia is a much better place to get a glimpse of authentic Italy and well worth a visit.